India – love it or hate it. My first visit was as a very young engineer in 1980. I was reluctant to go, but it was love at first sight. More recently I have been holidaying in different parts of India at least every couple of years. I find myself happiest touring rural India, somewhat off the beaten track, and combining my fascination with the people and culture with my love of colour photography. This talk is illustrated with 100 slides and focusses on the westernmost state of Gujarat, home to many so-called ‘tribal’ peoples. It touches on various topics including The Rann of Kutch, farming and irrigation, handicrafts, wildlife, stepwells, the Jain religion, and M K Gandhi, who was Gujarati. Anna Manning and Howard Jennings – Bangkok to Saigon by Tandem. 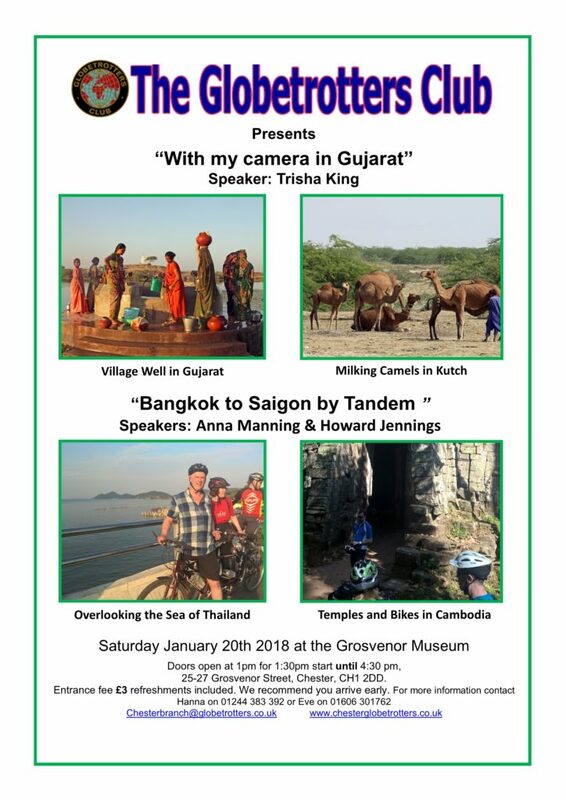 The talk will cover a two week trip where we explored Thailand, Cambodia, and Vietnam by tandem. We will describe how bike travel can bring you closer to the country you are passing through and the preparation needed to embark on such a trip. Not everything will be bike-focused: we will take time to describe the experiences we had from as many angles that we can think of so that you get a clear idea of the countries we travelled through. We aim to leave you in the position of having enough information to decide whether or not you would like to visit these three countries and whether a cycling holiday in this region is for you. I live in Liverpool and hope to come to the Chester meeting on 20th Jan to hear this fascinating talk about India. I traveled around India in 1982 & 84 and became totally addicted to this wonderful country. I joined Globetrotters club in 1981 and remained a member for many years. I still have all my old editions of Globe. I used to go to London to attend the meetings and was helped to plan for my first India trip by 2 members who had recently traveled there. As my first really positive action of 2018 I have just subscribed for the e-newsletter, and I intend to re-join Globetrotters even although I no longer travel abroad. I look forward to again meeting people who love travel, and I wish all Globies a very happy 2018.